Craig LeHoullier has been a frequent guest of this podcast series. 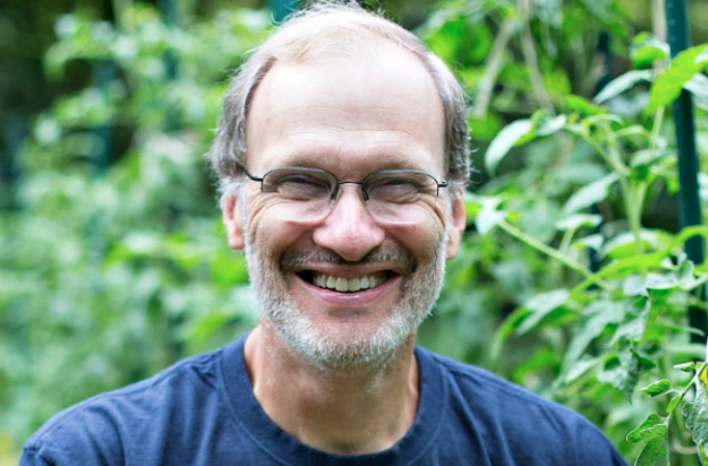 He joins us again today to follow up on our early 2018 series on seed starting. If you missed that series, I recommend you start there, so you have context for this discussion on tomato seedling. 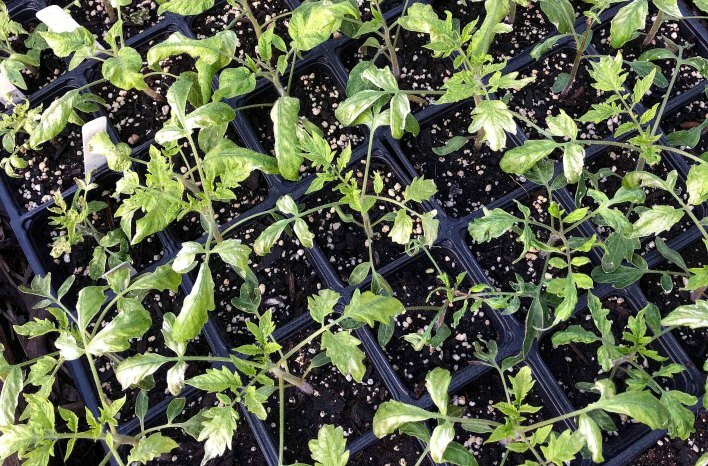 In this podcast, we check in on how things are going in the densely-planted seedling world. Many gardeners, including me, tried Craig’s dense planting technique for the first time this year. So, we discuss my success and missteps so far and learn that even Craig hit a few road bumps this time around. 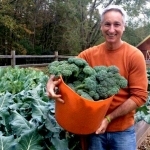 Craig LeHoullier is considered an expert in the world of the tomato and is a frequent guest of The joe gardener Show. Craig’s method was born out of necessity. He needed to grow a lot of plants in a small area and without a greenhouse. So rather than plant a seed or two per cell, he began planting lots of seeds in the same space. Flash forward a couple of decades and many trials and tribulations later – and Craig has become a recognized expert in the world of tomatoes. With all gardening methods, it can be difficult to thoroughly explain all the nuances and little details that help or hinder success. So as I tried the dense planting technique for the first time, I had a few questions and made a few mistakes. It turns out I’m not alone. Many gardeners have been in touch with Craig throughout the past several weeks with questions about their crowded seedlings too. As soon as we try to apply something new in our garden, we all tend to scrutinize the results more closely. Things we might not have noticed with a tried-and-true method suddenly seem disastrous. Why aren’t these seedlings thriving? What have I done wrong? Let’s all take a deep breath and be reminded how resilient plants can be. Trying to read the signals your young plants are sending is one of the best ways to head off problems as those plants start to mature. But, sometimes, we overdo it in our studious enthusiasm and wind up worried for no good reason. Because he isn’t new to dense planting, Craig laughs that some nights he can sleep because his experience tells him “something” is really nothing. He’s already been through it, worried about it, and pushed the boundaries of what those of us new to this world are experiencing for the first time. 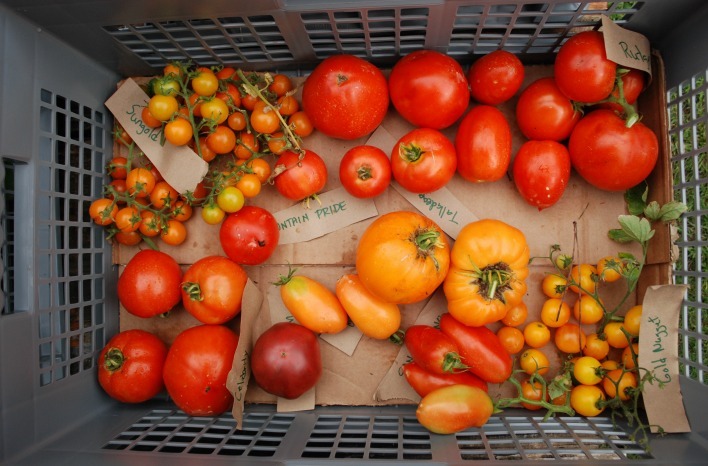 Gratuitous tomato crop photo… Aren’t these guys gorgeous? 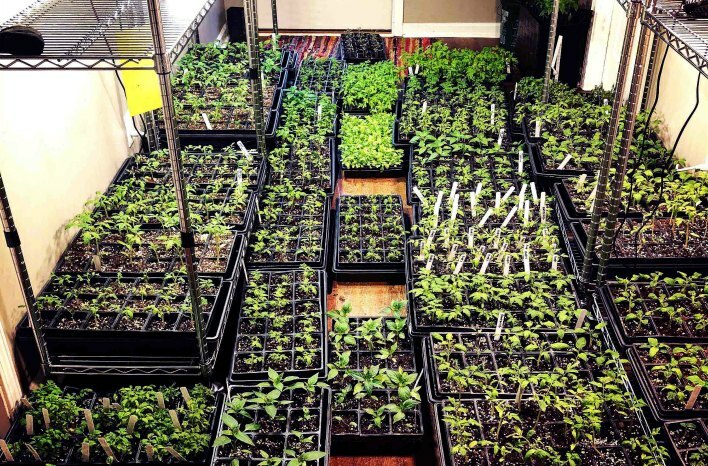 Starting from seed offers a much wider diversity than buying starts. This has been a challenging weather year for many, and even Craig has been thrown for a few loops. 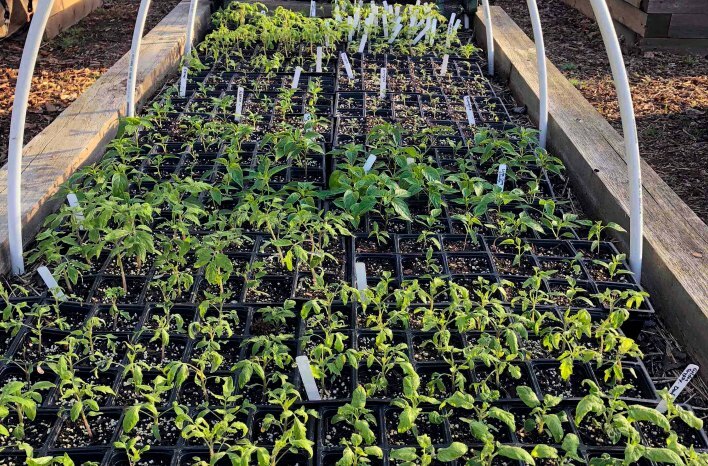 He took advantage of a brief warm period in February to gradually harden off his seedlings before the transplant stage. Suddenly, things turned colder – and have remained colder. Those seedlings, now transplanted, haven’t had the benefit of any warm evenings to stimulate top growth. They have remained in a state of suspended animation for weeks, and Craig expects the whole crop to fall behind the usual development schedule by a week or two – unless the weather suddenly changes again to provide unusual warmth. Time will tell. Is he sweating this period while his plants aren’t really growing? His years of experience remind him to be patient, and the growth will come. 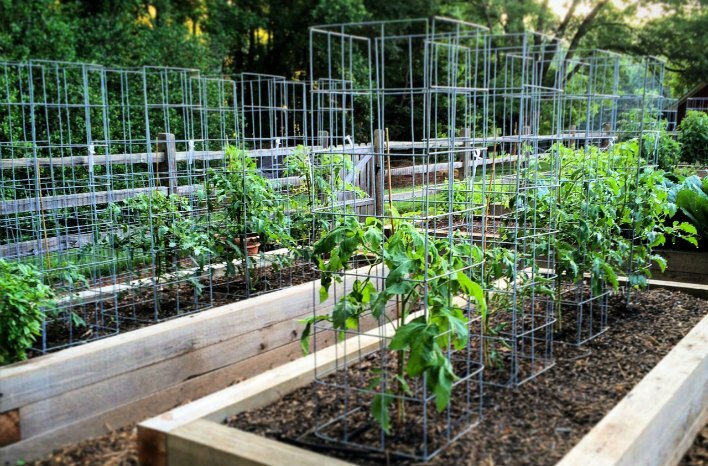 Gardening is a continual improvement process. The bumps along the road can be our greatest teachers, as long as we apply those lessons in future seasons. Inevitably, once we think we’ve got something down pat, the weather will switch the game up all over again. Here’s a look at some of my seedling trays under LED lights during their final days indoors. When I began my own seeds this year, I scrounged for all the seeds I could find onhand. That included seeds from my 2009 Victory Garden Challenge. Thinking back to my seed starting discussion with Craig at the beginning of this year, I planted my old Victory Garden seeds as well. Just as Craig predicted, these older seeds took longer to germinate, but they did – in fact – germinate, at nearly a 100% rate. Along with dense planting, I threw another new process into the mix in my seed starting process. I switched from fluorescent lighting to LED lighting and have been surprised at some of the marked differences. While fluorescent lighting must be right down next to the plants, it took some time to find the best distance for LED. I used 160 watt bulbs and, over a few days, found that the sweet spot for that lighting strength was 46”. That’s right, I had to hang those bulbs 46” above my trays before the seedlings stopped showing signs of light bleaching. As I went even higher, seedlings began to show more signs of legginess, so I knew I’d found the right balance at 46”. I have a fairly large area to house seedlings, but even I didn’t have enough room to keep everything under the lights. So, some of the seedling trays were relegated to an adjacent bathroom. The truth is, I was so focused on observing the seedlings under the lights that I neglected the bathroom clan. 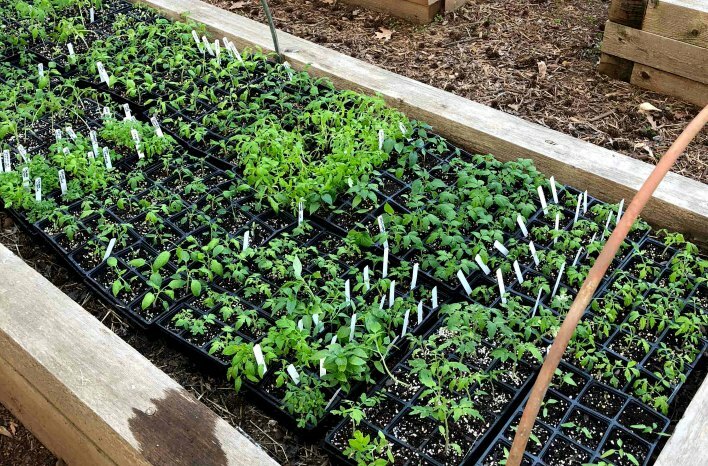 When I recently moved all my seedlings out into the garden to begin the hardening off process, I found that the neglected seedlings were doing just fine – even with just the light of a small window. Another testament to the resiliency of plants. Look how green and happy all these seedlings were after spending their first night outdoors. This has been the Season of the Close Call. Is anyone else impatient with the philosophy of gradual? Well, I almost paid the price for my impatience on a few occasions. Case in point: I wanted to avoid shuffling all those seedling trays back indoors overnight, so I watched predicted temperatures to be sure they wouldn’t dip too low for safety (32 degrees or below). One morning when I woke, I found that the actual temperature in my garden was just 34 degrees! That was several degrees colder than what had been predicted. Sure that I had damaged or killed them all, I rushed to the garden to find perfectly intact seedlings. This didn’t surprise Craig at all. He has pushed those temperature boundaries over the years and learned that young plants won’t be impacted at 34 degrees. No big deal for him. Heart-stopping moment for me. My seedlings still looked intact after spending a night outdoors that dropped to 34 degrees F.
Only a few days later, I left my seedlings uncovered to get some sun while I ran an errand. This time, I wasn’t so lucky. I was away just a bit too long and returned to find my young plants with sunscald. Ouch. They will recover, and this damage will be just a memory in coming weeks – but they sure don’t look very pretty right now. Mistake Three: Not long after the sunscald incident, I awoke to find that the temperature had dropped again below what was predicted. This time the air had dipped to 30 degrees! Craig confirms that, in his experience, seedlings can’t survive 30 degrees. Fortunately, I had sheltered all those delicate seedlings under a double layer of row cover (adding that second layer as a result of my sunscald incident). It was that thick covering that saved me from this particular gardening disaster. The heat from the day had remained trapped under the row cover and provided a slightly warmer microclimate – keeping the air around those plants above the external temperature and warm enough to get them through the night. When you are relying on temperature predictions in this way, be sure you’ve done some homework. I recommend that you regularly compare the official temperature prediction of your area with the temperature in your garden – they will typically vary consistently by at least a few degrees. After spending just a bit too much time in direct sunlight – sunscald. These plants will recover, but they don’t look as vibrant as I would prefer. Your garden may tend to be slightly warmer or slightly cooler than the location where the official temperature is recorded. It is this slight variation that can make or break your season. Now, I had done that, and I knew what range I had to work with. However, this has been – for many of us – a very strange year indeed, with temperatures jumping around beyond prediction rates and sage experience. It’s good to know what my plants can withstand, but I’m not sure, I will cut things so close next year. Every time I look at the sunscald on my little green army, I cringe. 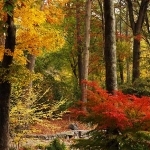 We all strive for the pinnacle of health in our plants – vigorous growth and verdant color. If they don’t look perfect, we feel we have done something wrong. Yet, the customers who have purchased Craig’s plants year-after-year have noticed that his plants seem to “hit the ground running” while nursery-bred plants need a longer period to adjust. Craig’s plants, like mine – and yours – were strengthened by their time in the elements. When done right and when the weather doesn’t throw you a curve ball, the plants can look beautiful too. But they don’t need to look picture perfect early on in spring to be bountiful producers in the growing season. In fact, there may not be anything wrong at all – you may just be looking at them at the wrong time of day – or week. Craig has noted that his plants look sickly in the dusky light just before night falls. That used to concern him and make him wonder what they needed. Then, he noticed that they looked the picture of health the following day – in morning light. Now, he knows that different light angles can have a significant and sometimes deceiving impact on the look of his plants. Craig has also observed that different plants and varietals will react differently to variable weather. Eggplants look terrible when the weather is colder, but once warmer days arrive, they will recover and thrive. Each varietal has – not only a distinctive fruiting quality – but also a unique response to environmental conditions, like cooler spring temperatures. 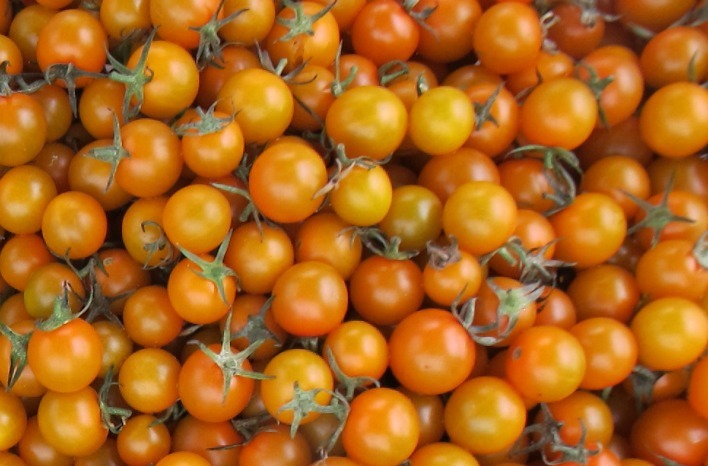 Certain varieties of tomato also look unhealthy in the cool of the early season – specifically, Sun Gold tomatoes or any heart-shaped, plum or paste tomato. 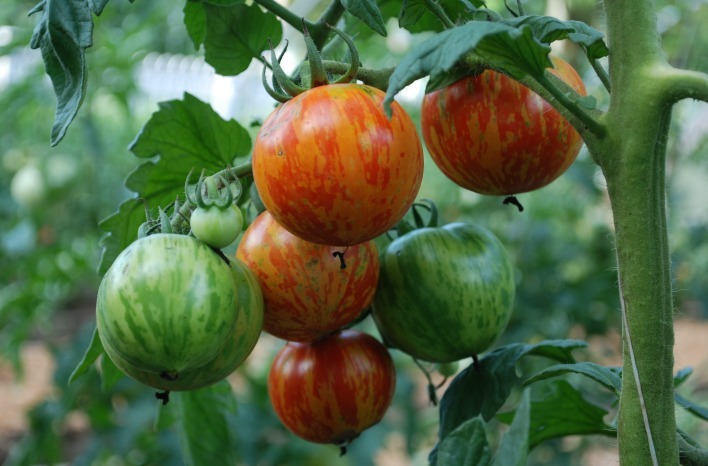 These varieties may all look worse for wear if your weather is cool, but don’t worry – they will rebound and look great once the temperature finally turns warmer. The moral here is that, while it’s good to observe our plants for signs of distress, sometimes the plants are doing just fine and only need a bit more patience on our part. You will only learn when to act and when to wait through your own experiences. In the seed starting podcast series, Craig had mentioned that he doesn’t provide his seedlings any supplemental nutrients. As a guy who likes to provide some fish emulsion to my seedlings, I was curious to revisit this. I have found in my gardening, that a small amount of fish emulsion is beneficial to my seedlings. Craig explains that the seed starting medium he prefers, and also uses during the transplant stage, does include a trace amount of nutrients. In his experience, he’s found that to be sufficient to get his seedlings to a robust 6”. He’s also found that his clients prefer knowing that the plants they buy from him haven’t been treated with anything natural or synthetic. Whether you choose to wait to provide supplemental nutrients or do choose to add fish emulsion or another nutrient source, just be careful against over feeding. Young seedlings are very sensitive to too much feeding, known as fertilizer burn, and will show signs of it in the margins of their leaves. A brown color or burned look at the edges of your seedling leaves is a sure sign you have overfed. Even though I’m fortunate to live in a warmer southern climate, I am still always eager for the arrival of temps warm enough to send my plant starts into full growth mode. If you do overfeed your seedlings, what do you do? Record it. Make a note for next time. The suffering may last for a time, but the learning will go on. As long as you remember and apply the lessons of your mistakes in the garden, you are still going in the right direction. We all make errors in judgment and – even when we bring our A Game – the weather is sure to bring a few lessons of its own. Here’s to making the journey together! As always, I recommend that you scroll to the top of this page and listen to the podcast recording – if you haven’t listened already. In this recording, you’ll hear more on Craig’s seed germination experiments, stories of our mistakes, and some great laughs.